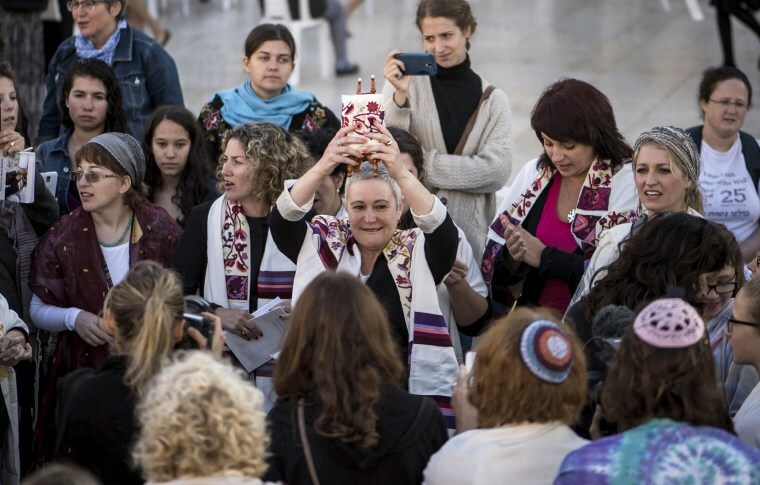 TEL AVIV, Israel — A Jewish women's rights group smuggled a tiny 200-year-old holy scroll to Jerusalem's Wailing Wall to pray on Friday, in contravention to the rules governing one of the holiest places in Judaism. “The rabbinical authority doesn’t want us there, they only want people who practice ultra-religious traditions to pray at the Wailing Wall," said Shira Spure, a member of Women Of The Wall, which has been fighting for equal praying rights for 25 years. "This is ridiculous." In 1967 when Israel took over this part of Jerusalem, the government gave the control of the Wailing Wall — also known as the Western Wall — to ultra-orthodox rabbis who run the area according to their interpretation of Jewish law and traditions. One of these norms includes banning women from praying with a Torah scroll, the centerpiece of Jewish religious tradition. Women of the Wall smuggled the 11-inch Torah scroll brought from England, Spure said. “We believe this size was made just for this reason, when Jews are not permitted to pray publicly and freely.” The group also conducted a Mat Mitzvah, or Jewish coming of age ritual for girls that is also banned at the wall, for 12-year–old Tammy Gotlib. “There is no reason this should not go on every day. It didn’t bother anyone and meant a lot to Tammy and her family," Spure added. Officials from the Wailing Wall rabbinical authority were not immediately available for comment.